publisher, TaleBlade Press, which was kind enough to send me an actual hard copy of the book (remember my aversion to ebook copies of picture books?). My kids were a little confused as to why the kids’ book that came in the mail was for ME and not them, haha! Written by B.C.R. 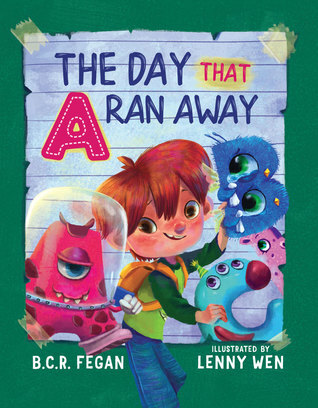 Fegan and illustrated by Lenny Wen, The Day that A Ran Away–published just yesterday, September 1, 2018!–is an alphabet picture book with simple, approachable text and engaging illustrations. It tells the tale of why Jet doesn’t have his homework – all the letters ran away! As one of a plethora of alphabet books for young kids, the text itself doesn’t really stand out to me. It’s not bad, but it’s not amazing either. What I DO like about it is the moral lesson–Jet’s teacher plays along with his “the letters ran away” ruse but tells him at the end that now the letters need to be punished for their crime… and Jet has to write them all 20 times instead of one! That’ll teach kids to lie about their homework, right? The illustrations are what bring the book to the next level. They’re not perfect–for instance, my kids did not recognize that the “O” was, in fact, an “O” (“What’s THAT, Mommy?”), and I can’t say I blame them for that. Overall, though, each page is dedicated to one letter and is filled with little details to spark conversation and reinforce the letter: for instance, the “U” is a unicorn, sitting under an umbrella, with a ukulele on the ground next to her. It’s a book I’m happy to add to our collection. For my almost-2-year-old it’s a great way to repeat the alphabet while the colorful illustrations hold her attention; for my almost-5-year-old, the complexity of the illustrations will give us a lot of practice matching objects with their beginning letters. Thank you to TaleBlade Press for the review copy; check out Amazon to buy yourself a copy!